James Riddle Hoffa was the vitriolic head of the powerful Teamsters Union in America. He was also in the pay of organized crime. In 1931 Hoffa began organizing a union among workers of a grocer’s. He won his men a 40 per cent pay rise and earned himself a full-time job with the International Brotherhood of Teamsters. However, the only money Hoffa then earned was a percentage of the subs from members he had personally recruited. In days when employers would think nothing of settling industrial disputes with violence Hoffa encouraged his members to fight fire with fire. 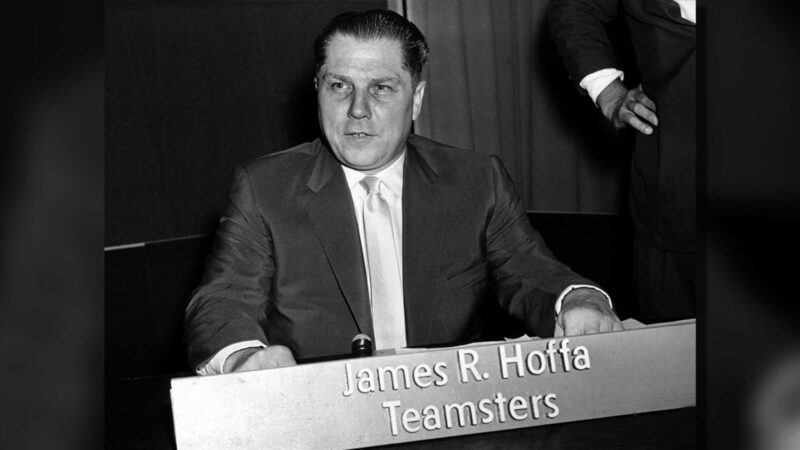 As times changed and employers became more enlightened Hoffa began to intimidate other union leaders and in 1946 was investigated for extortion. On 4 October 1957 he was elected head of the Teamsters after his predecessor, Dave Beck, was jailed for bribery. By 1964 virtually every lorry driver was a member of the Teamsters. It was rumoured that Hoffa was stealing a portion of the union funds for himself and his criminal friends. The government stepped in and in August 1964 Hoffa was jailed for 13 years for jury tampering, conspiracy, and mail and wire fraud. Former Attorney General Bobby Kennedy had said, “Hoffa is a very evil influence on the United States and something has got to be done about it.” Hoffa was freed on 23 December 1971 after President Richard Nixon commuted his sentence. As part of his freedom Hoffa was banned from union activities until 6 March 1980. Despite this, Hoffa began moving to regain control. Others preferred that he remained “retired”, including New Jersey union leader Anthony “Tony Pro” Provenzano, who also happened to be a member of the Genovese crime family. The Mafia preferred to work with Hoffa’s successor Frank Fitzsimmons. On 30 July 1975 Hoffa arranged to meet Provenzano and another mobster, Anthony “Tony Jack” Giacalone, at a restaurant. When his guests did not show, Hoffa made two calls from a pay phone in the restaurant. The next day Hoffa’s green 1974 Pontiac Grand Ville was found unlocked in the restaurant car park. Questioned by police, Provenzano and Giacalone swore they knew nothing about a meeting with Hoffa. Hoffa had been seen that day in the back of a maroon Mercury belonging to Joe Giacalone, the son of Anthony, and in 2001 a DNA match was made to Hoffa with a hair found in the car. Joe Giacalone claimed that he had lent the car to a friend. Hoffa was legally declared dead in 1982. Machus Red Fox Restaurant closed in 1996. Hoffa’s son, JameS P., is president of the Teamsters while his daughter, Barbara, is a judge.